Eyelid surgery is the third most popular plastic surgery procedure in the United States. According to the American Society of Plastic Surgeons, there were more than 200,000 eyelid surgeries performed in 2013, which represents a 6% increase from the previous year. Below are before and after photos from Dr. Bryan Ambro of Annapolis Plastic Surgery. 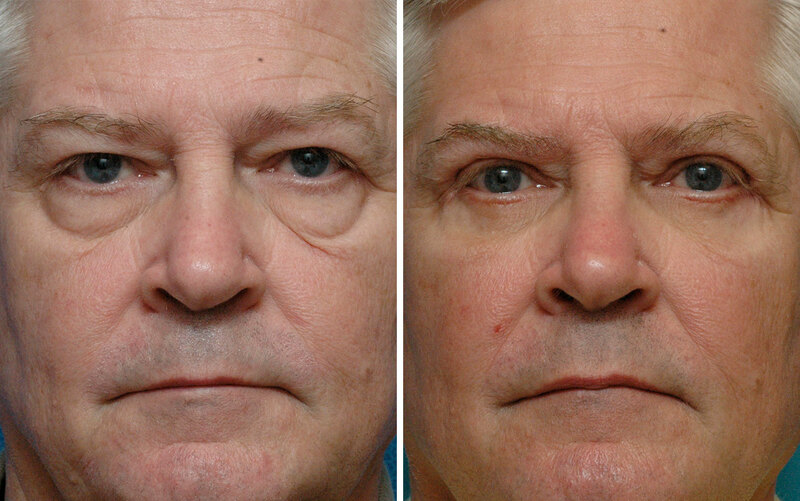 The first shows a male patient who had eyelid surgery on both the upper and lower eyelids. The second shows a female patient who had upper eyelid surgery and laser skin rejuvenation on the lower eyelids. Blepharoplasty is the name for surgical eyelid rejuvenation, where excess skin is removed from the upper and/or lower eyelid to improve the cosmetic appearance of tired looking, aged eyes. In some cases, blepharoplasty is performed for functional reasons, when sagging upper eyelid skin impairs vision, or for reconstructive purposes, for example if skin cancer is removed from the eyelid. At Annapolis Plastic Surgery, eyelid surgery is performed by Dr. Bryan Ambro, a double board certified facial plastic surgeon. Dr. Ambro performs blepharoplasty in our in-office procedure suite or our out-patient surgery center at Anne Arundel Medical Center in Annapolis, Maryland. 1. You will be relaxed using a light “twilight” sedation or local anesthesia (in some upper eyelid only procedures). 2. For the upper eyelids, Dr. Ambro will make an incision, that can be well hidden, in the creases of the eyelid. For a lower blepharoplasty, Dr. Ambro will conceal the incision inside of the eyelid or just below the lower lash line. 3. Any fatty deposits will be removed or repositioned, the muscles will be tightened (if necessary) and excess skin will be trimmed. Dr. Ambro will close the incision with very fine absorbable sutures. 4. Eyelid surgery takes a few hours and you will be able to return home the same day. You can expect mild bruising/swelling and very little discomfort in the first 2-3 days. A follow-up appointment will be made for 5 to 7 days after your surgery. The sutures are removed at this visit (if necessary). Full recovery generally takes 2 weeks. Most patients return to work after 5-7 days with makeup to cover minor bruising and swelling. The cost of blepharoplasty varies widely from one patient to another. Dr. Ambro offers consultations for you to come in to be examined in order to review your options. During that appointment, we will discuss the individual cost of your treatment. We offer CareCredit financing for qualified patients. Generally, blepharoplasty is a cosmetic procedure and not covered by insurance. However, some carriers will cover a portion of the cost for functional and/or restorative blepharoplasty. To qualify, the redundant skin must cause a significant visual impairment. Insurance may also cover reconstructive aspects for the removal of skin cancer, tumors, etc. Lower eyelid surgery is generally considered cosmetic with a few exceptions. Please consult with your individual insurance carrier and benefits details for specific information about your plan. There is no alternative to a surgical eyelid lift if you have significant excess skin or fat bulging.However, for patients with mild or moderate signs of eyelid aging, Dr. Ambro does offer alternatives that are also very effective at eliminating the “tired” eyelid appearance. Dermal fillers are one of the most popular non-surgical treatments to rejuvenate the eyes. Fillers can be used to eliminate the appearance of under eye bags, smooth away wrinkles, crows feet and fine lines around the eyes. A new filler, Voluma™, can be used to restore volume to the cheeks, which can also improve the appearance of the lower eyelids. Botox®, Xeomin®, and Dysport® injections can be used to lessen the appearance of crow’s feet, and in some patients have a similar effect to an eyelid lift or brow lift. These cosmetic injectables work by temporarily disable the nerves in the muscles of the brows that cause a worried expression. Our fractional laser can be used around the eyes to minimize fine lines and wrinkles and improve the tone and texture of skin. 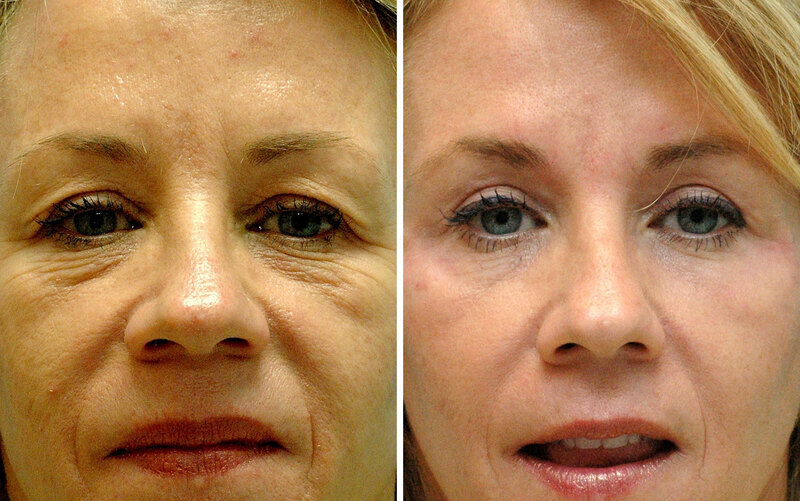 Laser skin resurfacing can have a skin tightening effect that can make the area around the eyes look lifted and more youthful. Fat Transfer is a safe, natural and more long lasting alternative to fillers to eliminate the appearance of upper eyelid hallowing and lower eyelid bags. Fat can be removed from practically anywhere on the body, purified and then carefully grafted into the eyelid region to restore youthful volume.